The CPCS A17 Telescopic Handler course aims to provide the candidate with a thorough practical and theory training in operating a Telescopic Handler in order to to enable the candidate to pass the CPCS Telescopic Handler Theory and Practical Tests. 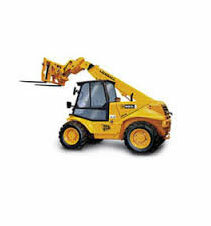 Undertake all Telescopic Handler pre-use checks. Prior to Telescopic Handler training, all visitors must report to reception on arrival and follow site safety rules at all times.There are no catering facilities on site, so delegates need to provide their own lunch. There are tea and coffee facilities available.Candidates must bring and wear their PPE on site for plant testing. They must also bring signature and photographic identification as required for all testing. The CPCS Telescopic Handler Theory test is recorded digitally by the tester to ensure adherence with CPCS Standards. The CPCS Telescopic Handler Practical test may be recorded using a Video recorder if the CPCS request it. Once you have achieved your Red CPCS Trained Operator Card it lasts for 2 years. During these 2 years you must work towards and achieve your NVQ in Plant Operations to upgrade to a Blue CPCS Competence Card.Total Construction Training may be able to offer you funding towards this NVQ.